Tenorio volcano is located between Rincón de la Vieja (to the NW) and Arenal (to the SE). This region now has a new telemetric, digital seismic network consisting of six stations. Although not well instrumented for seismic measurements, Tenorio normally has very little seismic activity. In contrast to this historically moderate seismicity, an earthquake swarm with many tectonic events was recorded at both Tenorio and nearby Miravalles volcano during October and November 1997 (BGVN 22:10). During October-November 1998 a total of 170 microearthquakes were recorded in the Tenorio area, 82 of which were located. Most events were recorded during 17-23 October, with up to 10 felt by people near the epicenter in Tierras Morenas (Barquero and Taylor, 1998). Magnitudes were 0.9-3.3 at depths of 0.5-10 km (most <2 km) and a maximum intensity of MM IV. Within the Tenorio area are several fault systems oriented mainly NW-SE and NE-SW. There are also complex old volcanic caldera structures. The seismic swarms recorded in 1997 and 1998 denoted tectonic activity in these fault systems, considered neotectonic structures, and so they are not thought to be related to volcanic activity. References. Barquero, R., and Taylor, W., 1998, Proyecto Geotérmico Tenorio: Los enjambres sísmicos periodo octubre-noviembre de 1997 y 1998: Informe preliminar. Inf. OSV 98.11 ICE, 15 p.
Further References. Boschini, I., 1998, Análisis preliminar del enjambre de sismos de la región de Miravalles-Tenorio de octubre y noviembre de 1997: Inf. OSV 98.08 ICE, 36 p.
ENEL, 1990: Estudios de reconocimiento y prefactibilidad geotérmica en la República de Costa Rica. Fase II. 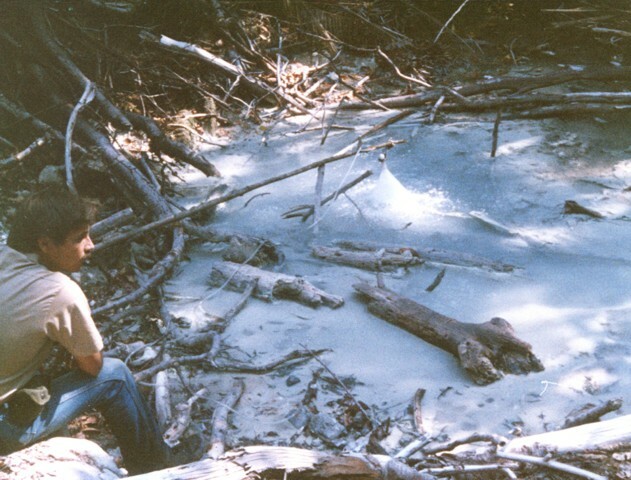 Estudio de prefactiblidad del area de Tenorio: Informe de Síntesis, 66 p.
ICE-ELC, 1983, informe geo-vulcanológico, Pyrotecto Geotérmico Miravalles: Informe interno ICE, 53 p.
Guillot, P.Y., Chiesa, S., and Alvarado, G., 1994, Chronostratigraphy of Upper Miocene-Quaternary volcanism in northern Costa Rica: Rev. Geol. Amér. Central, v. 17, p. 45-53. Information Contacts: Rafael Barquero, Observatorio Sismológico y Vulcanológico Arenal-Miravalles (OSIVAM), Instituo Costaricense de Electricidad (ICE), Apdo. 10032-1000, San José, Costa Rica. The Global Volcanism Program has no Weekly Reports available for Tenorio. During 5-27 October, 14 earthquakes were located on a 5-km-long SE-NW trend from the summit of Tenorio (figure 1). The swarm, centered around 10.7°N, 85.03°W, was possibly associated with known faults. The earthquakes had depths of 5-10 km and magnitudes of 0.6-2.1. Figure 1. Major faults in the Guanacaste Range of Costa Rica and October earthquake locations around Miravalles and Tenorio volcanoes. During 5-27 October, 620 earthquakes were recorded, but only 187 could be located. Courtesy of ICE. An unrelated swarm consisting of 27 events occurred during the same period near the village of Tierras Morenas at the SSW foot of Tenorio. The swarm was centered at 10.6°N, 85.0°W and was aligned along a 7-km NE-SW trend, possibly correlating to known faults. The earthquakes had depths of 7-12 km and magnitudes of 0.4-3.3. 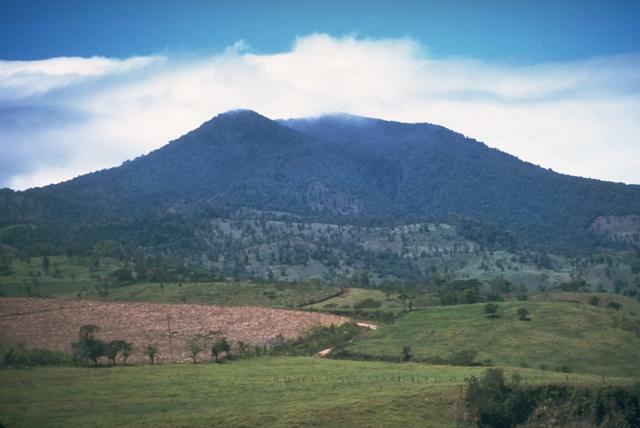 The 225 km2 dominantly andesitic Tenorio volcanic massif anchors the SE end of the Guanacaste Range and consists of a cluster of densely forested NNW-SSE-trending volcanic cones. Overlapping lava flows from the principal peak, Tenorio, blanket the NW-to-SW flanks and descend the NE flank. The NW-most of three craters of the central cone is sparsely vegetated and appears to be the most recently active. Volcán Montezuma to the north has twin craters, the northern of which fed a lava flow to the NE. Additional pyroclastic cones are found to the NE and SW of the central complex, and the Bijagua lava domes were constructed on the northern flank. A major debris avalanche covered about 100 km2 below the S flank. A legend exists of an eruption in 1816, but the volcano was densely forested at the time of an 1864 visit by Seebach and is not considered to have erupted in historical time. Fumarolic activity is present on the NE flank. Stoiber R E, Carr M J, 1973. Quaternary volcanic and tectonic segmentation of Central America. Bull Volcanol, 37: 304-325. The Global Volcanism Program is not aware of any Holocene eruptions from Tenorio. If this volcano has had large eruptions (VEI >= 4) prior to 10,000 years ago, information might be found on the Tenorio page in the LaMEVE (Large Magnitude Explosive Volcanic Eruptions) database, a part of the Volcano Global Risk Identification and Analysis Project (VOGRIPA). There is no Deformation History data available for Tenorio. There is no Emissions History data available for Tenorio. 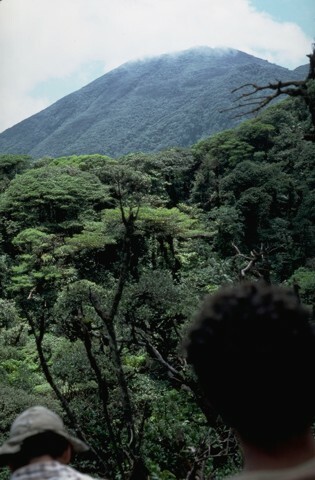 The verdant forests mantling the Tenorio volcanic complex are seen from the Río Celeste drainage. The Tenorio complex consists of five volcanic cones aligned NNW-SSE. Several archaeological sites are located around the complex, testament to the importance of the area to prehispanic Indians. 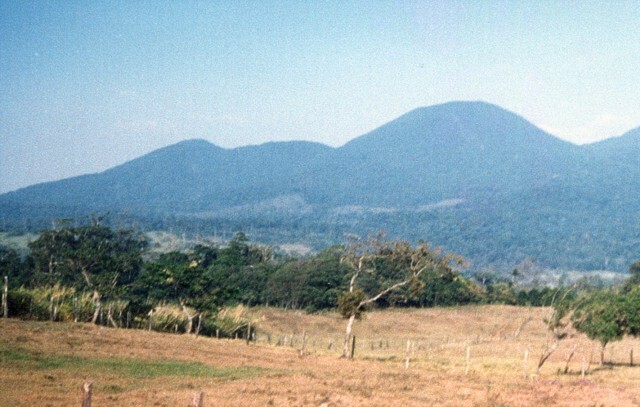 The Tenorio complex marks the SE end of the Guanacaste Range; a range of low hills separates it from the next volcano to the SE, Arenal. Photo by William Melson, 1985 (Smithsonian Institution). The densely forested Tenorio volcanic complex forms a group of volcanic cones at the SE end of the Guanacaste Range. Only the NW crater of the central cone is sparsely vegetated. The age of the most recent eruption of the Tenorio group is not known. A legend exists of an eruption in 1816, but the volcano was densely forested at the time of an 1864 visit by Seebach and is not considered to have erupted in historical time. Fumarolic activity is present on the NE flank. Lush jungle drapes the Tenorio volcanic complex and covers overlapping lava flows that descend the NE flank. The virgin forests of the complex are a highlight of Tenorio National Park and provide habitat for exotic fauna, including puma, tapir, paca, and jaguar. 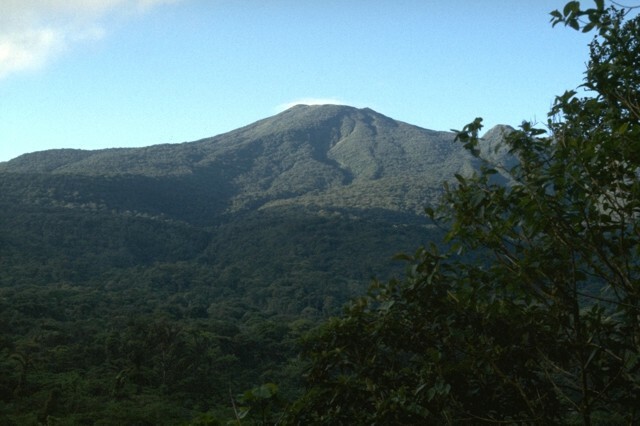 The summit of 1916-m-high Volcán Tenorio, the highest peak of the complex, contains small twin craters, of which the NW-most one appears to be the youngest. 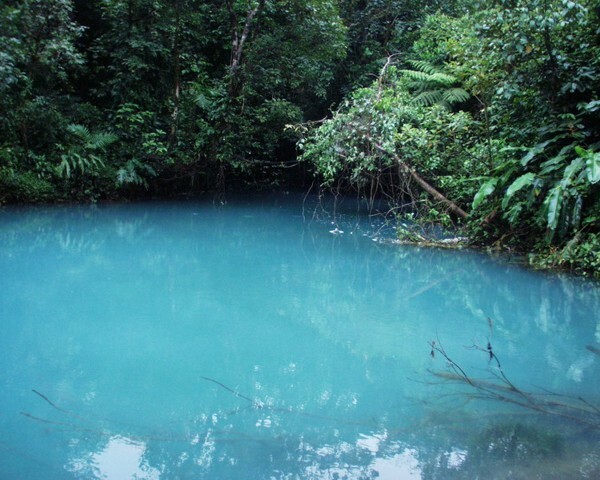 La Casa thermal spring is located in El Roble thermal area on the NE flank of the Tenorio volcanic complex. Temperatures of 46 degrees Centigrade and a pH of 3.5 have been measured at this location. At the nearby Los Quemados thermal area, 1 km to the south, vegetation has been destroyed over an area of 2500 sq m, and strong fumarolic activity has killed small animals. Temperatures up to 94 degrees Centigrade and a pH of 2 have been measured at Los Hervideros thermal area on the Roble river. Photo by Jorge Barquero, 1998 (OVSICORI-UNA). Cerro Montezuma volcano in the Tenorio volcanic complex is seen here from the SW. The Tenorio complex marks the SE limit of the Guanacaste Range, which extends NW towards the Nicaragua border. This complex of five volcanic cones along a NNW-SSE trend has a cluster of volcanic domes at its northern end. No confirmed historical eruptions have occurred at Tenorio. Despite the report of a volcanic eruption in 1816, the volcano was densely forested at the time of its December 1864 visit by Seebach. Photo by Jorge Barquero, 1987 (OVSICORI-UNA). Wispy clouds cling to the walls of Tenorio's crater lake. This densely forested volcano provides habitat for some of Costa Rica's most exotic wildlife, including pumas, jaguars, tapirs, and a wide variety of bird life. Heavy rainfall in this forested terrain feeds crystalline waters that are important in regional hydrology. 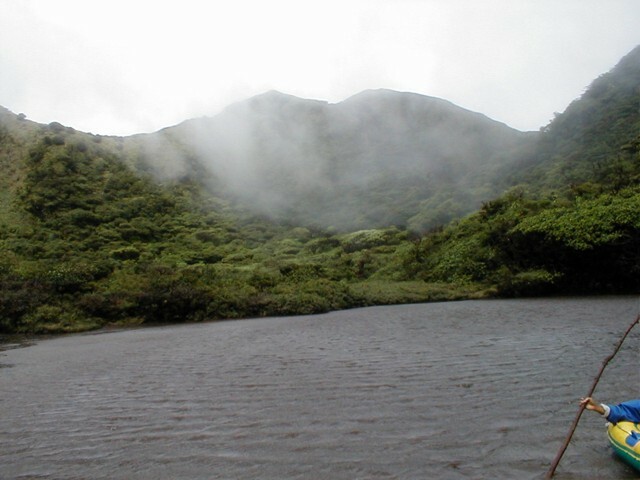 One of the most popular areas on the flanks of Tenorio volcano is the Río Celeste, a highpoint of the Volcán Tenorio National Park. At a point where two streams meet, the waters turn a heavenly light blue color. Legends indicate that after God was done painting the sky, he washed the brushes in the Río Celeste. A thermal area with fumaroles and mudpots is nearby, and the river cascades over a waterfall of the same name. Photo by Eliecer Duarte, 2004 (OVSICORI-UNA). Large Eruptions of Tenorio Information about large Quaternary eruptions (VEI >= 4) is cataloged in the Large Magnitude Explosive Volcanic Eruptions (LaMEVE) database of the Volcano Global Risk Identification and Analysis Project (VOGRIPA).